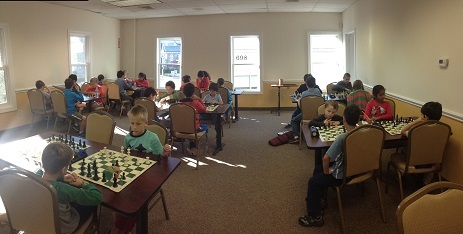 As always we had three sections of exciting chess with many interesting games and unexpected results. 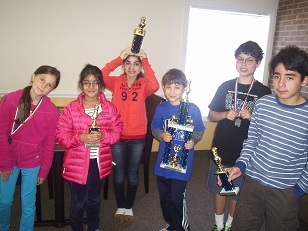 In the K-2 section it was Atmika Gorti and Owen Jacobson who tied for first (3/4 each). Atmika looked to be running away with the tournament, winning her first three games, but Owen stopped her in the final round! 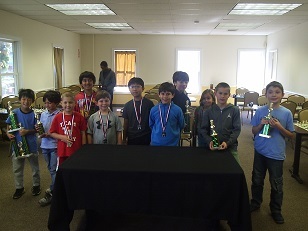 In the large (and super competitive) K-5 section it was Dillon Hurst who was running away with the tournament. Dillon started with 3/3, but once again the leader was caught in the last round. This time the stars aligned and there was a four way tie for first! This month’s co-champions are Matthew Liew, Andrew Gray, Ethan Cushman and Dillon Hurst. Rating favorite Bryan Weisz began the tournament with three convincing victories. However, just like in the other sections, the final round saw the leader fall, creating yet another tie for first. This time top honors were shared by Bryan Weisz and Anna Argulian! Both finished with 3/4!